This type of apartment consists of a fixed section (bedroom and bathroom) and mobile section. Thanks to the clever Move Home system, you’ll be able to move your kitchen to enlarge your living area or even create a second bedroom. The module consists of a kitchen with island and an entirely functional and compact fold-up office space. 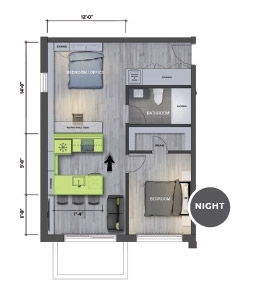 Sliding the module towards the bedroom allows you to maximize the living area up to 222 sq. ft. (20.6 m2). 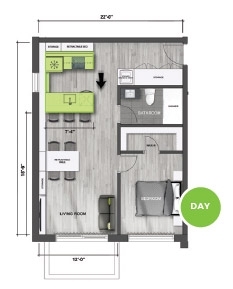 Conversely, moving the module back towards the living room allows you to create a 168 sq. ft. (15.6 m2) bedroom.